For rug collectors and aficionados, a beautiful Oriental rug is nearly always the “jewel in the crown” of any room. After all, an exquisite, hand-knotted Persian or Oriental rug never goes out of style! However, it can be tricky to showcase your fine area rug in a way that does not compete with the furniture, wall color, and other such elements of any room’s decor. Our tips can help you find the best design scheme for your favorite Persian or Oriental rug. Rely on neutral colors. 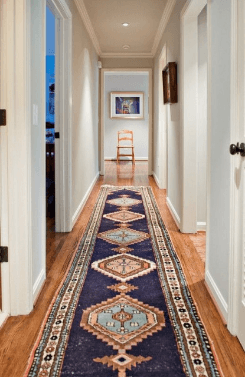 Rug lovers tend to collect multiple Oriental rugs, and having all rugs displayed throughout your house can indeed be tastefully done, with a little planning. We recommend allowing sizeable expanses of neutral flooring, such as hardwood or simple, neutral tile, to be exposed between each rug. Similarly, keep the paint colors in each room simple and neutral. The “busier” the floor is with rug designs and patterns, the simpler the walls and other flooring should be. Be selective with patterns. The pattern on your Oriental rug is most likely one of your favorite aspects of the rug’s design, and you may worry that including any other type of pattern in the room would be overwhelming. It is possible to use multiple patterns in your design. Just be sure the patterns on throw pillows, artwork, frames, furniture, and anything else that is prominently displayed in the room still echo the colors found in the pattern of your Oriental rug. For example, patterns – even wild ones – in brocade pillows, drapery, and artwork can still coexist with your Oriental rug as long as the colors in all patterns echo each other. Fine Oriental area rugs deserve to be displayed prominently and used as the anchor of any room’s design. They also deserve the best care and cleaning, and should only be trusted to highly rated rug cleaning companies. For rug owners in San Marco, Avondale, St. Johns, and throughout Northeast Florida, RugPro Oriental Rug Cleaning is the best professional rug cleaning service. We specialize in rug care and will develop a customized cleaning regimen to get your favorite area rug clean in the most thorough and careful way possible. We are passionate about Oriental rugs, and clean each one meticulously, with truly outstanding results. Treat your rug to a thorough cleaning by the best Jacksonville FL rug cleaners today!